For over a half-century Andre Kole has been widely known among professional magicians as one of the most creative illusionists in the world. 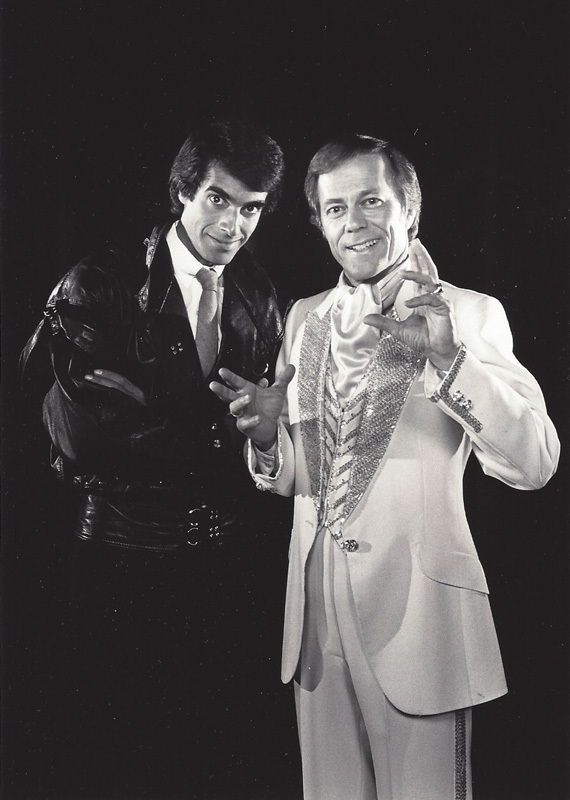 Many of the over 1000 illusions he has invented are performed by the top magicians in the world including David Copperfield with whom he has collaborated on over 100 illusions including the disappearance of the Statue of Liberty. His tours have taken him to all fifty states and seventy countries world-wide. Having spent more than twenty years investigating claims of psychic powers, Andre is widely acknowledged as one of the world’s foremost authorities on paranormal claims. Several decades ago I issued a challenge to all psychics and others claiming to possess paranormal powers, including but not limited to levitation or walking on water. If any one of the many thousands of them stepped forth and demonstrated their power under test conditions, I would hand him or her a personal check for $25,000. As if that tidy sum wasn’t enough incentive, imagine the acclaim and free publicity to be gained by simply reading a thought, moving an inanimate object with the power of their mind, levitating, or predicting the future—without the use of trickery. I say “without the use of trickery” because, as the inventor of illusions performed by David Copperfield, Siegfried and Roy, Harry Blackstone Jr., Doug Henning, and countless other magicians, and as someone who investigated psychics, witch doctors, psychic surgeons, mind readers, and all manner of paranormal claims all over the world, I’d become adept at spotting deception long ago. It’s been over forty years since I first made the $25,000 offer. In that time, thousands of psychics have come and gone. Millions of followers have been duped by them, chasing a lie in search of the truth. Billions of dollars have been sucked from those followers’ checking accounts. In that same time, I’ve publically exposed the schemes of many of those who claim to possess paranormal powers. But in all of those years, my resolve to handsomely reward and publicly acknowledge any genuine psychic was unwavering. Frankly, I wasn’t too concerned about losing my $25,000, because I had seen so much deception passing for “the real thing.” Regardless, I was still open to being convinced. Now here we are, nearly a half-century later, and no one—no one—has been able to claim the prize. Surely, if in fact some people are gifted with psychic and other paranormal powers, someone would have stepped forward, demonstrated just one of those powers, and walked away with the prize money and the acclaim that accompanied it. But those who did step forward, submitting themselves to being fairly tested, failed the test. Just one such test was conducted while I was touring Russia in 1993. An individual claiming the ability to astral project asked to be tested, hoping to win the $25,000 prize. I devised a simple test involving a boxlike cover placed over the individual’s head and the sentence, “Billy is a boy,” written in Russian on the opposite side of a chalkboard only a few feet from the alleged astral projector. The subject was then asked to project his astral body to the other side of the blackboard, read the sentence, and reveal it to the committee we had gathered for the test. After a few minutes the subject shared what he thought was written: “God loves us.” Not a bad guess, since the claimant knew I was a Christian, but a guess nonetheless. I returned to America with my $25,000. When I collaborated with David Copperfield to accomplish incredible feats like walking through the Great Wall of China, levitating across the Grand Canyon, and making the Statue of Liberty vanish, the impossible seemingly became possible to millions of onlookers. There were those who claimed that David had special supernatural powers. They couldn’t fathom how anyone could accomplish such impossible feats without the aid of otherworldly powers. I’ve been accused of the same despite the disclaimer I issue at the start of every show—that everything the audience is about to witness is only an illusion. Yet there are still some who simply are not about to be convinced. The belief that some people have paranormal powers is ubiquitous, even in our “enlightened” age and culture. Hollywood and entertainment media have had a field day capitalizing and profiting from this fascination with the paranormal. Some skeptics claim that the prevalence of such beliefs is the result of religious teachings, and, ironically, as a Christian, I agree with them—but not in the way you might think. I do believe in the supernatural. But I also believe that God alone possesses the ability to perform the truly miraculous. What concerns me are teachings within Christian churches suggesting that some people—presumably under the influence of Satan—possess supernatural (or paranormal) powers. Bible passages are even marshaled in an attempt to provide credence to such teachings. I find that many Christians assume, without really examining the biblical evidence, that Satan has far more power than God ever gave him and that he confers some of his powers to humans. But as I examine the Bible, I find that it lines up perfectly with the empirical evidence before me—people do not, in fact, possess miraculous powers that God reserves only for Himself. The Bible does tell us that Satan is the father of lies. Deception is his stock-in-trade. By deceiving us to believe that he is more powerful than he actually is, Satan’s deception becomes a powerful tool for even more deception. The three illusionists who wrote Unmasking the Masquerade—Rod Robison, Adrian Van Vactor and Toby Travis—put forth a convincing case that prominent beliefs in the paranormal are erroneous and without merit. You’ll explore with them some of the history of alleged paranormal activities that were later found to be fraudulent or simply misunderstood. Some of these incidents had enormous impact on our culture and still do, years and even centuries later. You’ll delve into what the Bible has to say about Satan’s true powers and lack thereof, and how the scriptures have been misunderstood and even, in some cases, manipulated to lead people down dangerous paths to deception and unwarranted fear.